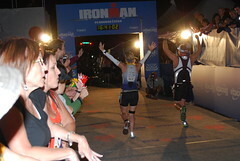 I completed my first Half Ironman distance triathlon in Oceanside, CA on 4/2/2011. It was awesome! My goal ultimate goal was to go under 6 hours but I thought that I would most likely be closer to 6:30. 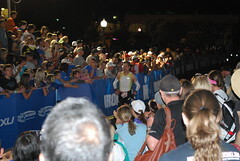 I was thrilled to finish in 5:59:41! Full race report can be found here. Kind of a strange month because I had a big race in the beginning so there were a couple of light weeks dues to recovery. I did 30 less total miles than the month before but 4 more hours or training. This is probably due to the fact that I swam a lot! (twice as much as the previous month). I also upped the running and had a light month of riding. Another notable thing that happened in April is that I started this blog. I am really enjoying it and I hope that people continue to read it. And lastly, late in the month I tried trail running. I liked it so much there is a 50K penciled on my calendar for November 2011! Wow, and this is just one month? Amazing! Way to go!